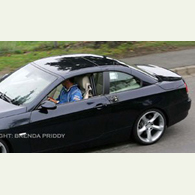 (autoinsidernews) - With less camouflage than we have seen so far, the upcoming 2008 BMW 3-Series convertible was caught on camera during what has to be final testing. Except for the folding hardtop, we expect everything else to be the same as the 3-Series coupe, which means 328 and 335 versions. Rumors say that we may not see an M3 convertible due to the added weight of the hardtop, reports Trend. The is no official word about when BMW will unveil the 3-Series convertible, but expect it to debut in Detroit or Geneva, with sales starting in Europe in the early spring next year. North American sales are expected to begin before summer.